Saturday morning I had to get measured up for a Kilt, for my wedding next year. As predicted it was a very easy, but expensive morning. One more thing crossed of that list. After a bit more shopping we headed back to the flat. For some reason we decided to start mixing cocktails... The rest of the night goes a bit fuzzy, but suffice to say some mixes were worse than others, but I cant remember which were which. I slept well. 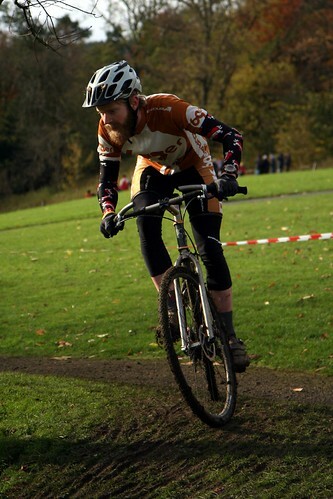 Sunday saw us rise earlyish and head over to to the SXC race in Peebles. As I hadn't brought a bike I borrowed Jon's trusty Roshambo, while he rode his “Supra Beasto” with an Endomorph front tyre- not very 'cross. That said, he was dressed as a Ninja, which you don’t see a lot of in Belgium either. The field was about 100 strong and the course was very good. Euro-style I guess- lots of grass and tricky, slippery off-camber corners but several fast tarmac sections. Fun! I didn't have a very good start but I had a few fun battles with the people around me. About 20 minutes in I finally got in to a rhythm and put in a few quick laps and enjoyed picking people off. I kept feeling stronger towards the end and finished feeling pretty happy with myself. No idea where I came but that doesn't really matter, does it?! After a quick change it was time for the kids race, which also had a large field. They all seemed to be loving it and it was great to watch them, elbows out against each other. At the prize giving they all won something and got an enthusiastic cheer from the crowd. We scoffed birthday cake and bacon rolls. Anja won the women’s category, much to her surprise. I won a beer for having a beard. All good. After that there was just time to get back to Glasgow, cook and eat some bolognaise and catch our flight. Really feels like it was more than a weekend. indeed, you did a good ride, it was a strong field, I should have handed bottles, me thinks.